Camille Senum is the president of the St. Cloud State University chapter of the Public Relations Student Society of America. Meet this up-and-comer! I became involved with SCSU PRSSA at the beginning of my sophomore year of college, before I fully understood what public relations was. There were many opportunities available, and students without a lot of experience were always encouraged to get involved and help with projects. During my second semester of PRSSA, I served on our chapter’s executive board as secretary. Although the secretary position wasn’t an intense public relations role, it was a great way to learn about public relations through first-hand experience. My first internship experience was in the promotions department at Leighton Broadcasting, a marketing company for St. Cloud area radio stations. Working for Leighton Broadcasting gave me the opportunity to interact with the community, plan events and gain an understanding of how a marketing company operates as a whole. Through PRSSA, I’ve been lucky enough to tour many PR agencies, and hear valuable insight from professionals in the industry. I found a reoccurring theme that many agency employees had pervious internship experience at nonprofit organizations. Professionals often suggested that nonprofits are the best way for students to get experience, so I took their advice! I’m currently the marketing and communications intern at United Way of Central Minnesota. Working for a nonprofit has allowed me to work on several diverse projects, and given me a well-rounded background of experience I feel is necessary to market myself. I’ve done everything from write press releases, submit articles and photos to the local Citizen Times, plan events, write success stories on individuals who have used United Way partner programs, create promotional materials and practice customer relationship management with our donors. 2. How did you get to become a "llama expert?" I like to consider myself a “llama expert” due to my extensive work on “Llama Llama Read-A-Rama,” an annual United Way of Central Minnesota event. The goal of the three-day event is to educate children and families on the importance of literacy. My focus of the event was to create a four-page insert that will run in the St. Cloud Times. The insert includes activities to get children excited about reading, a reading guide and resources for families. In the past, United Way interns have been given the exciting task of wearing a llama costume during the Pajama Party kick-off event at the St. Cloud Public Library. My internship supervisor thought I could use some experience as a llama, so I wore the costume around the office one day. It sure did help inspire some creative ideas! 3. You graduate in May from St. Cloud State University. How has your job search been going? What advice do you have for fellow job seekers? My job search is in full swing, as I’ll be graduating from SCSU in May. It’s been exciting and stressful at the same time. I check blogs, agency sites and PRSSA resources regularly for internship postings. I’m constantly looking for new ways to make my cover letter and resume stand out from the crowd. What I’ve found most helpful in my job search is utilizing my network. I know students hear “network, network, network!” all the time, but establishing a network of meaningful connections is what’s really important. Some of the best advice I’ve received is to establish and maintain connections with professionals you can relate to, and where a connection comes natural. It’s not a contest of who has the most business cards. I feel I’ve been extremely blessed to have developed relationships with professionals who have gone above and beyond to help me, especially with my job search. It’s a great feeling to know that I have people in the industry I can go to with questions, or for advice, and they are confident enough in me to pass my name along to their connections. 4. What suggestions do you have for other PRSSA presidents for a successful chapter? Start planning early. I would highly recommend having at least one executive board planning session over the summer, and one over winter break if possible. The beginning of each semester is such a busy time for everyone, sometimes by the time projects and event planning really get going, the semester is almost half over. Establish an executive board contract, in order to ensure all board members are aware of their duties and responsibilities. Ask for feedback from e-board and general members. I found it helpful to survey the chapter to find out what they hope to get out of PRSSA, what they feel has been done well and what they think we can improve on as a chapter. Be as encouraging as possible! I found it most effective to individually ask members to sign up for projects you think they would like, or run for positions you think they would be good at. I first ended up running for an e-board position when one of the current board members called me and asked me to run. 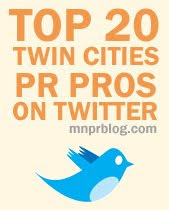 Take advantage of Minnesota PRSA opportunities and events. There are always fun events going on that students can attend at discounted rates, or use the Fellows Fund to cover the costs. My generation has grown up with social media in our everyday lives. Some people feel certain social media are just a fad, which may be true. However, social media as a whole is not a fad, and will continue to change how PR professionals communicate with their publics. I think it’s important to keep in mind that each type of social media provides a different aspect of communication. Some organizations may best reach their publics by Facebook or Twitter, while it may be more beneficial for others to use You Tube or blogs. I think one of the most important uses of social media is opening up a conversation between companies and consumers. By allowing a dialogue, consumers feel they are part of a community that shares similar interests, and a relationship is formed. Social media provides companies with various ways of connecting with their audiences and maintaining a mutually beneficial relationship. Though more traditional marketing and communication tactics are still relevant and necessary, social media has changed the game and needs to be integrated into all communication and marketing plans. My goal upon graduating in May is to obtain an internship at a Twin Cities area PR agency. Touring agencies have been a great way to see what agency employees do on a daily basis, as well as get a feel for what each office atmosphere and culture is like. 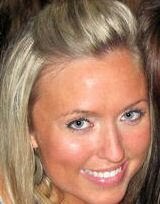 As a student, I’ve gained a diverse background of experience and I’m interested in many different areas of PR. I feel working in an agency would allow me to further establish my skills and give me a better idea of what my specialties may be, or which areas I’m more interested in. I’m also drawn to the fast-paced environment, and having the opportunity to work on a variety of accounts. Another great piece of advice I’ve been given is to not limit myself. Although I most see myself working in an agency, I’m always on the lookout for great opportunities and can’t wait to see where my future career takes me! Connect with Camille on LinkedIn.